1. Hälfte mit 250 g Rosinen verkneten. 2. Hälfte mit 200 g gemahlenen Mandeln verkneten. Backpapier unterlegen und zwischen die Stollen legen, damit sie nicht zusammenbacken, alternativ ein großes Blech nehmen. 50-60 Minuten bei 170 °C backen. Der Teig ist eine Abwandlung vom Quark-Öl-Teig, auch „falscher Hefeteig“ genannt. knead the 1st half with 250 g of raisins. knead the 2nd half with 200 g of ground almonds. From each of the halves form one stollen bread. 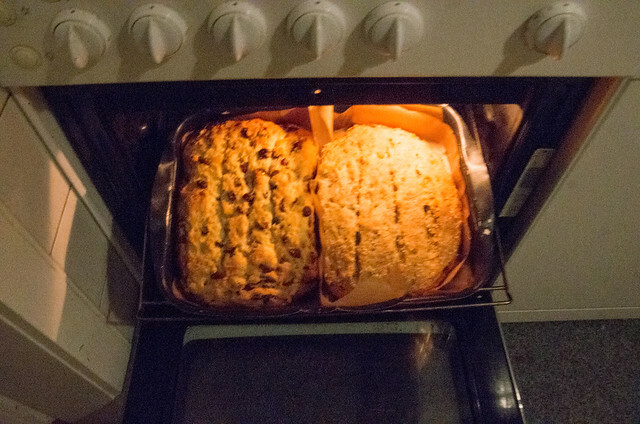 Put the baking paper on the baking tray, put the two parts of stollen on it and place the lugs between so that they do not cake together, alternatively take a large baking tray or bake them separately. Bake for 50-60 minutes at 170 °C. The dough is a modification of quark oil dough, also called „wrong yeast dough“. I added typical „stollen“ parts to the dough, like raisins and almond, and candied lime-peel and candied orange-peel. Dieser Beitrag wurde unter Übersetzung, Bild, Witzenschaft abgelegt und mit Übersetzung, Hutschi, Hutschi-Bild, Hutschi-Foto, Hutschi-Photo verschlagwortet. Setze ein Lesezeichen auf den Permalink. I plan to try this, it’s perfect for the holidays! You can bake also muffins with this sort of dough. Instead of rosins you can use little peaces of sliced apples or you can use cranberries. The baking time for muffins is between 20 and 30 minutes, and I made 6 big muffins with half of the amounts I gave above. The base recipee came from a sanatorium, where I learned about the usage of rapeseed oil. Later I recogniced that it was a recipee very similar to one my grandma used. For the „Dresdner Christstollen“ they use butter rather than oil, and no curd/Quark. additionally they put the rosins in cognac for a day. And they put fine shugar dust on it.